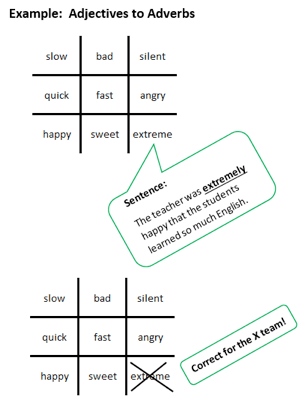 The Game: ESL – Tic Tac Toe is a quick, fun way to review any number of grammar forms or vocabulary words. It builds on higher level thinking skills and provides language practice in various skills—primarily listening, speaking, and reading. There are 1–4 students per team. Two teams play the game, with one team as Os and the other as Xs. The teacher distributes the premade Tic Tac Toe grids, or the students copy them from the board. The team jointly makes one sentence with the selected grammar or vocabulary. The other team judges the sentence with teacher assistance, if necessary. If correct, the team places the appropriate letter (O or X) in the square. If the sentence is incorrect, the square stays as is. The winning team is the first to get “3 in a row” horizontally, vertically, or diagonally. You can make several grids on a piece of paper and then copy one per team, or you can have the students draw their own game boards modeled after your sample on the board. You might want to consider placing more difficult language items in the center row going across the puzzle. That way, for a team to win, they will likely need to get a harder item correct. verbs followed by gerund or infinitive (write the verb and a second verb in the infinitive or gerund form needs to be created; e.g., start, stop, try, begin, dread, forget, keep, need, regret, remember). You can also use vocabulary from any text the students are studying, interested in, or learning. The students create their own versions of Tic Tac Toe based on a unit of study. For example, homonyms, compound words, possessives, pronouns, interrogative questions, idioms, vocabulary words related to a job interview, etc. The scope of the game is limitless. A student judge(s) is appointed per game. This person does not play on one of the teams. His or her sole responsibility is to serve as an impartial, qualified judge. He or she has reference materials available to help with judging. The students play for fun or for competition. This entry was posted in TESOL Blog and tagged classroom activity, classroom games, ESL games, evergreen, grammar games, marc anderson, teaching grammar, vocabulary games, word games. Bookmark the permalink. sorry sir, what do you have the book about this games? do have reference about tic tac toe games?